The Yamanote Line, part of the JR East series of rail lines connects most of Tokyo’s stations including Akihabara, Shibuya, Shinjuku, and Ikebukuro. About 3.5 million people ride the Yamanote line everyday in Tokyo. To understand how many people that is, the entire New York City subway system of 26 lines carries 5.08 million passengers per day. 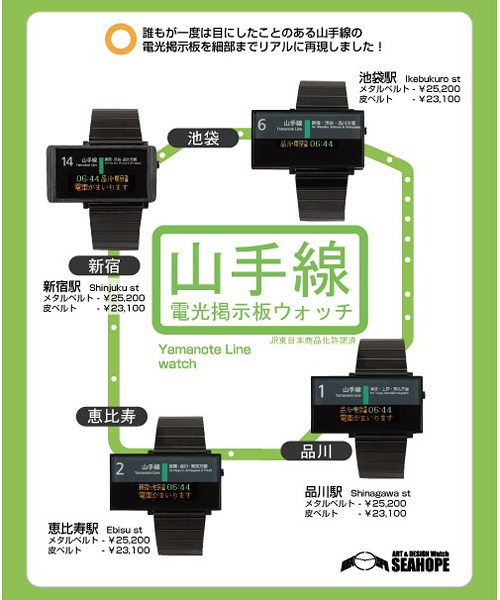 The Yamanote Line is one of the most used lines in all of Japan. I think that fact is evident by these watches from Seahope. The displays are modeled after the bulletin boards of 4 Yamanote line stops, Shinjuku, Ikebukuro, Ebisu, and Shinagawa. Fashion never comes cheap. The watches will run you from $212 for the leather strap, or $232 for the metal band.